There are lots of benefits to enhancing your life at home with technology. Seniors who have learned how to use technology experience decreased feelings of loneliness and a slower decrease of cognitive abilities. However, it’s understandable if you feel reluctant to try out new gadgets, as technology is constantly changing and the thought of keeping up with it can be daunting. But there are a handful of innovative tech gadgets that are easy to learn how to use and can drastically improve your day-to-day life at home. While it may seem frivolous to replace your hard-copy books, e-readers have some pretty enticing advantages over old-school pages. Most e-readers are equipped with accessibility features like adjustable font sizes, which can help if you experience eye strain or vision decline. They are also lightweight, which makes carrying them to doctor’s appointments or bus stops a breeze. The best part about e-readers is how easy they are to use: the basic, 6-inch Kindle* has a screen you control with your finger, meaning you mimic the motion of turning the page just like in a real book. Plus, e-readers give you instant access to many books. If you have never learned how to use a computer, you may feel intimidated by the thought of using a portable touch-screen tablet. However, many tablets offer simple operating systems that can be learned at any age. A few tablets, including iPads* and Amazon’s Kindle Fire*, even use high-tech voice recognition software so you can speak commands directly into the device. This technology is making internet searches easier than ever, no typing required. You can use tablets to play games, take photos, and stay entertained. Apps like Lumosity* offer short, challenging, downright addicting games to keep you entertained. Download Netflix or Crave TV and watch movies or TV shows from wherever you are. Staying fit can sometimes be a challenge, but wearable technology is making it surprisingly easy. Devices like the Fitbit* allow you to track how much exercise you get; team up with your physician to develop attainable fitness goals, and Fitbit will let you know throughout the day how close you are to achieving your goal. While all that sounds great, the best function of a Fitbit may be its ability to track sleep patterns. Getting the right amount of sleep is crucial to your health: too little sleep can result in memory problems or increased fall risk, and too much sleep can be a sign of mental health decline. 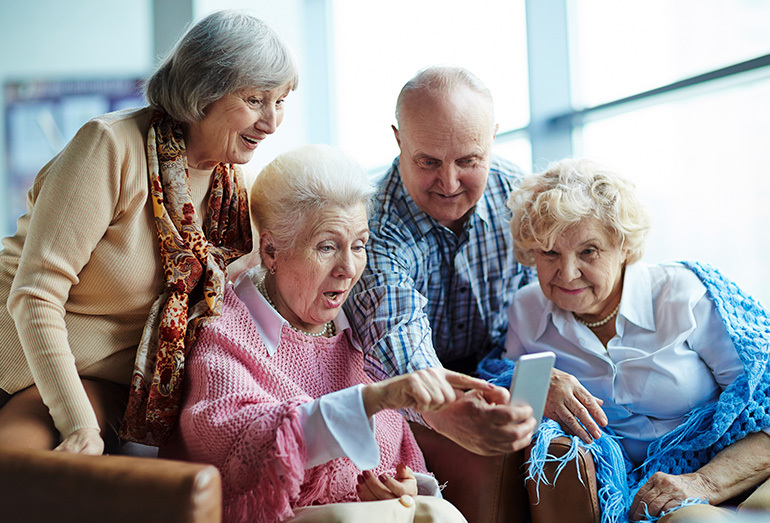 You may associate smartphones with your millennial grandchildren, but seniors can also benefit from using a smartphone! There are great features associated with smartphones – such as texting, taking photos, making video calls, installing apps of interest, plus they are extremely helpful in case of emergency. Many seniors are already upgrading to smartphones to take advantage of these features along with new options such as larger fonts, GPS maps, and voice controls. Smartphones such as Doro* are designed specifically with seniors in mind. Doro’s smartphones incorporate powerful technology with an easy to use interface. Each of these devices can help you remain independent and have a positive impact on your quality of life at home. Technology can help you stay connected, provide entertainment, make daily tasks convenient, and keep you safe.